Despite appearances to the contrary, I'm actually not a naturally neat person. It's a running joke both at work and at home that I leave a trail of chaos behind me, and I can be found by following the detritus of a dozen or so half-finished projects (and ice cream bowls) scattered about. One of my dogs has wolfed down more than one errant sock I've forgotten to put away (even though somehow its mate managed to find its way to the hamper). My brain is Pisces-typical: non-linear, unmoored and tangential. And yet, somehow, I'm also an organization freak. I get a dopamine rush from the sorting process. I get excited about storage boxes the way some people get excited about Disneyland. I'm always looking for a better way to store and display the things I love. And then that just goes up to eleven when the Spring Cleaning bug hits. 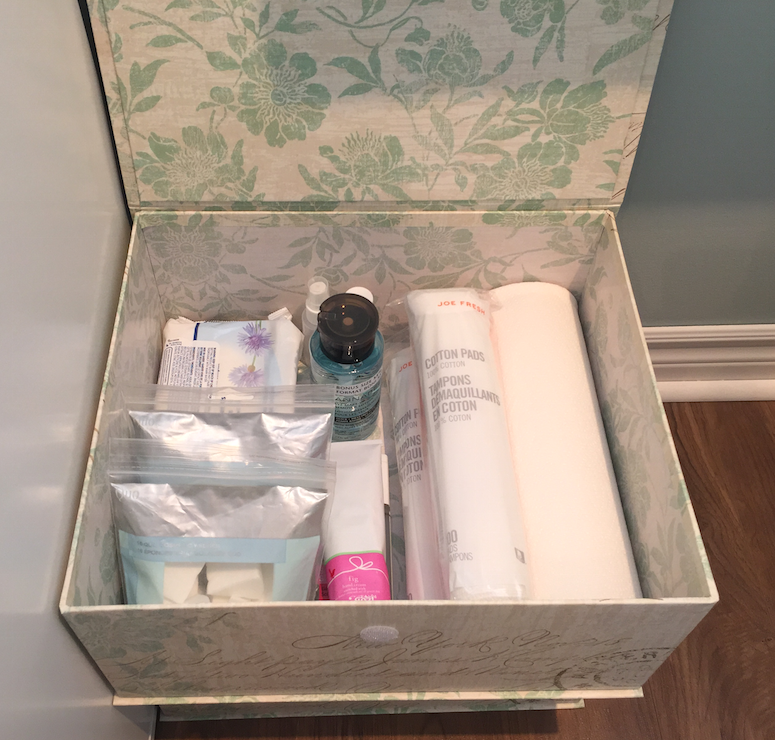 Last week that meant tweaking part of my vanity, specifically my hygiene and brush organization and storage. With the way I've set up my Alex units to form my vanity, I ended up with a blank wall to one side. It looked a little bit awkward, and struck me as a waste of space, but I couldn't figure out what to put there considering the space restraints created by the dimensions of the units and the space taken up by open drawers. I then came across some storage boxes (see?) and a cute little metal rack at Homesense, and inspiration struck. 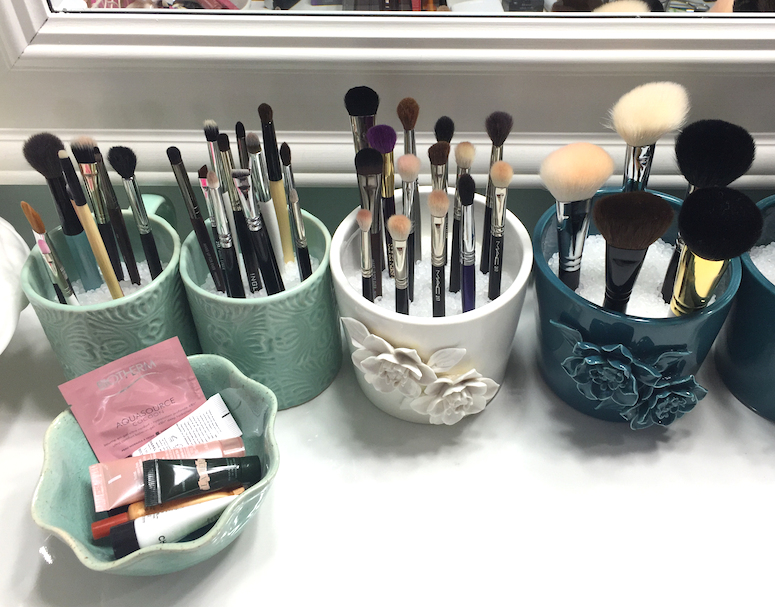 Up until now I had my extra makeup brushes and hygiene supplies in a cabinet on the other side of the room, and I figured having everything set up closer to the actual vanity would be more practical. And now I finally had a way of making that set up aesthetically pleasing as well. I asked Androo to shimmy the vanity over to the right by a couple of inches to create enough clearance for the drawers, and then he kindly put the rack up for me (god, I love that man). I then stacked the two storage boxes below (again, with enough clearance for the drawers of the Alex unit to open), and also added old tea set and perfume set boxes for extra storage. The top shelf of the rack is where I now keep my "cleaning" supplies: alcohol in a glass spray bottle, various makeup removers, spot brush cleaner, makeup wipes, hand cream (because alcohol is drying). 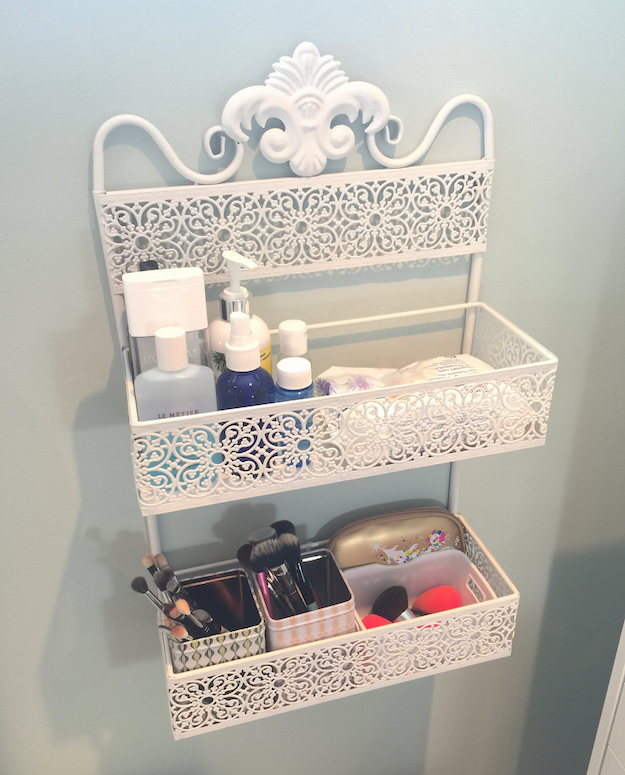 The bottom shelf contains little bins for makeup brushes and sponges that need to be washed. Instead of putting dirty brushes back into the jars on my vanity (to take up space and fester their bacteria on the clean brushes), they get popped in these bins, and then I can just grab one and go to the sink with it. 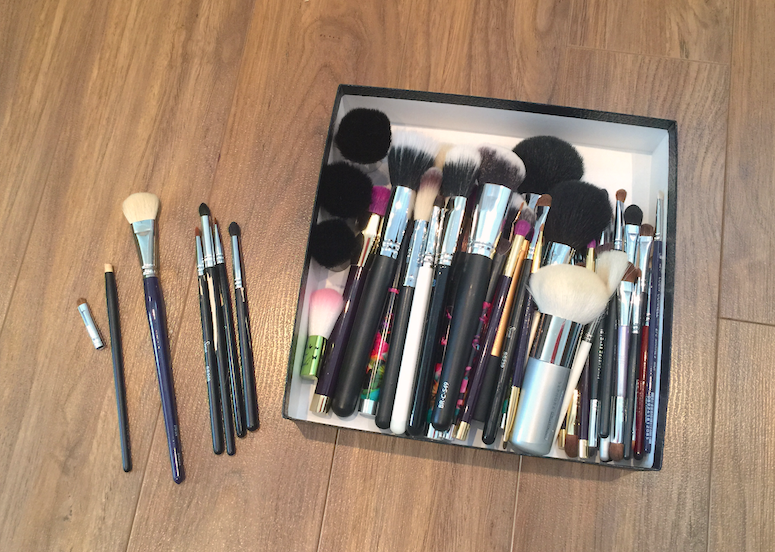 This way I also don't get overwhelmed with the amount of brushes that need washing, as I can do a bin at a time and rotate them back in. These are the ones I decided to keep, grouped together roughly by function. These passed the test because they are backups of brushes I rotate regularly (eyeliner brushes, powder brushes), or brushes I use less frequently but still like to have on hand (the Smashbox bronzer brush - that red lacquer handle is everything - the Glamcor finish brush). 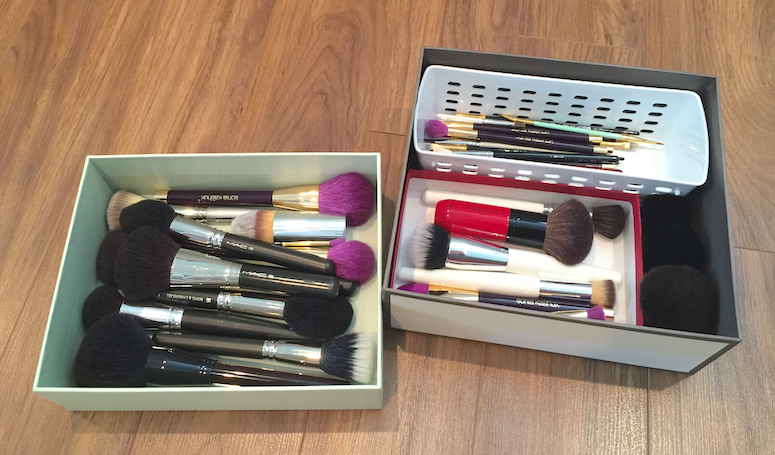 Before putting each brush back into my collection, I asked myself whether 1) it was good quality and 2) a truly useful brush and 3) a brush that would rotate to my vanity regularly. These are the brushes I parted with. Some where just cracked and otherwise broken (on the floor on the left) and went into the trash. The rest were brushes that didn't pass the criteria. This was especially the case for brushes where I had better quality options. I also passed on the majority of my Coastal Scents and Crown brushes, and some Sonia Kashuk ones from a set that didn't pass muster or where just not ones I see myself using. All of these have been cleaned and re-homed with the the daughter of a friend. 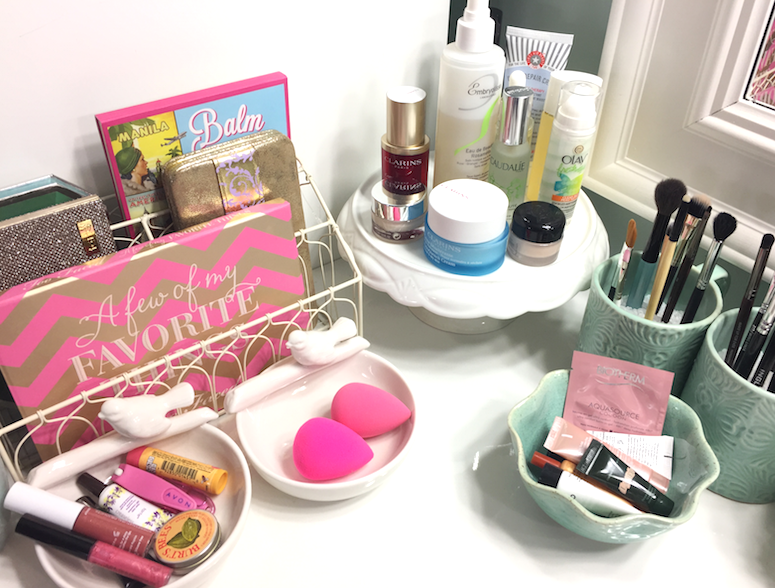 I didn't do any major re-organizing of my vanity, but I figured an overview of how I have it set up might be nice? This is where I keep my skin prep. The cake stand (from Chapters) has some of the moisturizers and toners I currently use (minus the Embryolisse, which I had just used). The little teal bowl (from Anthropologie) has some samples I'm trying out. The two white bird bowls (also Chapters) have my clean beautyblenders and assorted bits. Natural hair powder brushes, synthetic powder brushes, foundation brushes, highlighter/contour and precision powder brushes. And then all the Real Techniques in a mug without polypill, because their chubbier bases kept scattering all the beads when I pulled them out, which was making me INSANE. I would say the majority of my brushes in rotation right now are MAC, Zoeva, Glamcor, and Real Techniques, with some scattered in from Sonia Kashuk, Senna, Hakuhodo, Marc Jacobs, Chikuhodo, London Brush Company, Inglot, Wayne Goss and Cover FX. I did just purchase a few from the Walmart brand synthetic line to try out, but since incorporating a few really high quality brushes recently, I think my future purchases are going to be investments. I hate being a douche-y snob, but there really is no comparison between a higher-end Japanese-made brush and the mid or lower end equivalent in terms of application and the feeling on the skin. Especially with natural hair brushes. Your setup looks great! Thanks for sharing. Love these kinds of posts! Keep 'em coming :-). It's nice to see you back posting again as yours is a blog I frequent and I was getting worried this winter when you had a hiatus! So just wondering about your "beauty room". I am thinking of setting one up but can't decide how to manage my time if I move all my hair and makeup stuff out of the bathroom. On a typical workday morning do you get ready in your fab room or do you have some basics that stay in the bathroom? Where do you style your hair? What about cleansing? I notice you have toners and moisturizers in your room. 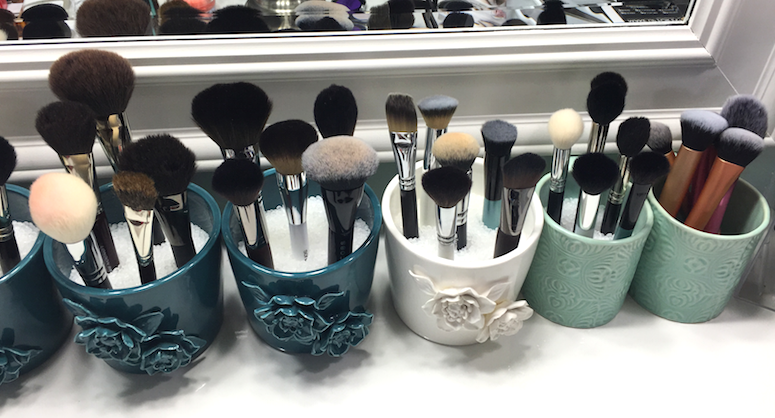 Do you wash your face in the bathroom and then move to your vanity to finish the process. 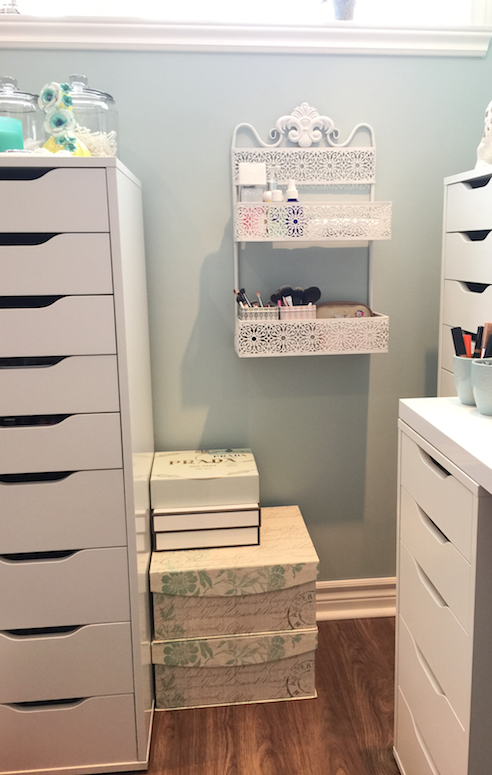 I am wondering if I will end up running back and forth from the bathroom sink to my vanity/desk if I set up a vanity and makeup stash in a different room and just wondering what others with a dedicated beauty room do? The dream would be to somehow have a sink in the room, right? Lol! I don't tend to do much with my hair on a daily basis, but what tools and products I have I keep in the bathroom, since that's most practical for me both in terms of storage and the sequence in which I would prepare. The toner I have in here is in spray form and really works more as either a "setting"/refreshing spray if the makeup is looking a little too caky or dry, or to dampen brushes for application (it has glycerin, so it helps things "stick"), rather than as skincare. So the long answer is that I do split my time between the bathroom and the beauty room, but I've organized the location of things in such a way that it works for my flow, so I'm not going back and forth. The only thing that's a spanner in the works is the beauty blender, since I have to get it and bring it upstairs to wet it - thus the wish for that sink, lol! If I was smart, I would keep them in the bathroom. I'LL PUT THEM IN THE BATHROOM. OMG. LOL about the Beauty Blender! Thanks for the detailed reply. I think I might take the time to rearrange some things over the coming long weekend and see if I can come up with a routine that doesn't involve too many extra trips around the house. I love your room btw, especially the custom nail polish racks. I believe that's how I first found your blog when I was searching nail polish storage ideas on Google.